The islands of Saint Pierre and Miquelon are the last French territories in North America. France’s North American colonies once covered thousands of square kilometres, with New France – as they were known – stretching from New Orleans in the South, through Louisiana, to Canada in the North. But after the Seven Years War (1756-63) between France and Britain – called the French and Indian War in North America – France was forced to cede Canada to the British and Louisiana to Spain. Only the tiny islands of Saint Pierre and Miquelon, nestling off the west coast of Newfoundland, stayed under French control. They have remained French to this day. Always keen to visit lesser-known places, I decided to explore this unique archipelago to discover for myself its charms. The ‘Overseas Collectivity’ of Saint Pierre and Miquelon is just over 240 km² and has only 6000 inhabitants, 90 percent of whom live in the capital Saint Pierre. Of the eight islands that make up the territory, only Saint Pierre and Miquelon are inhabited, although people also used to live on the Île aux Marins just beyond the harbour at Saint Pierre. The population is a combination of islanders who can trace their origins back several generations, French civil servants on a temporary posting, and other, mostly French, nationals who have decided to come and work here for a while. The first European to land on the islands was the Portuguese explorer João Álvares Fagundes in 1520. Some 16 years later, the French explorer Jacques Cartier, who claimed what is now Canada for France, declared the islands a French territory as well. It was not until the end of the 17th century, though, that the rocky archipelago was settled. Until the early 19th century, Saint Pierre and Miquelon fell victim to successive wars between France and Britain. Time and again the tiny islands changed hands between the two European powers which fought over, invaded, and raided them, even expelling the inhabitants. Since 1816 Saint Pierre and Miquelon have been French. The rich fishing grounds around the islands – especially for cod – attracted Basque, Breton and Norman fishermen, some of whom settled on the islands. Fishing became the mainstay of the islands’ economy, but the gradual depletion of cod stocks and a 1992 ban on cod fishing by the Canadian government have all but ended the local fishing business. Traditionally, smuggling was also something of a cottage industry on the islands. When in 1920 the United States introduced prohibition of sales of alcohol, Saint Pierre and Miquelon became a smugglers’ paradise. In 1931, the islands imported more than 6.8 million litres of whisky from Canada, most of it destined to be re-sold in the US. Fortunes were made, but when prohibition ended in 1933, the party ended and the islands fell into an economic depression. In World War II Saint Pierre and Miquelon came under the control of France’s pro-German Vichy regime. In 1941 General De Gaulle ordered his Free French army to invade the islands in a move which infuriated the Americans – and to a lesser extents the Canadians – whom De Gaulle had not told in advance. For the Americans, De Gaulle’s action violated the Monroe Doctrine, an American policy dating from 1823, which opposed any action in the Americas by European powers. In 1967 the by now President De Gaulle visited the islands, the first French head of state to do so. The main square in Saint Pierre is named after him. The picturesque islands have a network of paths that are ideal for exploring the more remote parts on foot. Large parts of the islands are bare and rocky, with steep coasts and only a thin layer of peat and clay soils. Combined with the tough weather and short growing season, this means there is limited scope for farming or rearing livestock. Today, the islands are developing aquaculture and tourism. Most tourists come from neighbouring Canada and the nearby US, for whom the islands’ distinct French culture is an attraction. Like elsewhere in France, the official currency is the euro. Even though they are in North America and just a few kilometres from the Canadian coast, the islands do indeed feel very French. Even so, the mostly wooden houses look more like those one would expect to see in neighbouring parts of the US and Canada and are often painted in bright colours. Red, white and blue tricolor flags flutter from public buildings, while shops sell a mixture of French and Canadian products. The food is French – think boulangeries selling baguettes and croissants – and in the restaurants the portions are what Europeans would consider normal, with the focus being on quality rather than quantity. The French spoken is much nearer to that of metropolitan France than that of Quebec. The Basque influence also lives on: the flag of Saint Pierre and Miquelon incorporates the red, white and green crosses of the Basque flag and in Saint Pierre there is both a Basque cultural centre and a large wall for playing the typical Basque ball game of pelota. There are as many small Renaults and Citroëns zipping about the streets as there are large North American all-terrain trucks roaring along them. The latter are easier and cheaper to ship to the islands. As one might imagine, there is not a huge amount of traffic, but for about 10 minutes at midday the roads suddenly become busy as offices and shops close and everybody races home for a civilised lunch (and perhaps a verre de vin…). Saint Pierre has the dubious distinction of being the only place in North America where the guillotine has been used. In 1888 Joseph Néel was convicted of killing a man on the Île aux Chiens. He was executed by guillotine in August the following year. But first the guillotine had to be shipped from Martinique. When it arrived it did not work properly and the authorities could not find anyone on the islands who was willing act as executioner. In the end, a recently arrived immigrant was persuaded to do the job. This series of events inspired the film The Widow of Saint-Pierre (2000). The guillotine can be seen in the museum in Saint-Pierre. 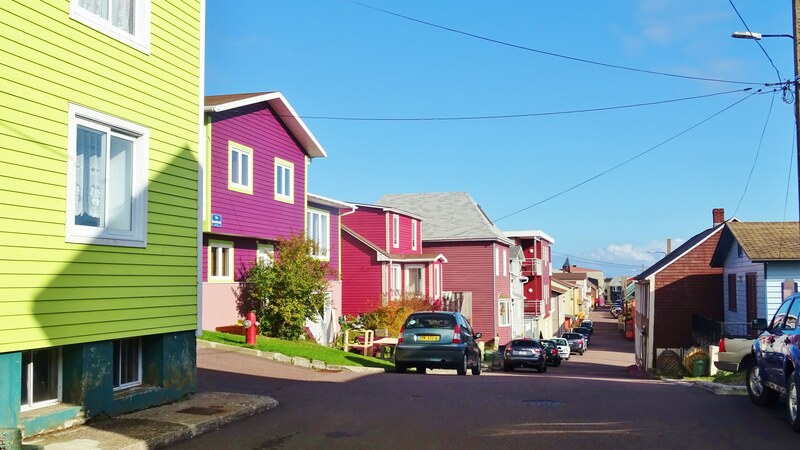 Like most small island communities, Saint Pierre and Miquelon has a special feel to it. People were very friendly and would spontaneously say ‘bonjour!‘ to me on the street, even though I was a complete stranger. I visited the islands out of season and yet there was still plenty to do and see, all in a very relaxed atmosphere. Saint Pierre and Miquelon, ce petit territoire est bon ! During my visit to the islands I stayed at the charming Les Nuits Saint Pierre.